Certificates of entitlement (COE) for a record 44,303 vehicles were revalidated last year, with cars making up the bulk of the extensions. The latest data released by the Land Transport Authority (LTA) showed 29,531 car COEs, 8,850 commercial vehicle COEs and 5,922 motorcycle COEs were revalidated last year. This exceeded the previous record in 2007, when COEs for 33,339 vehicles - close to 90 per cent being commercial vehicles - were revalidated. That phenomenon followed a crash in commercial vehicle COE premiums when the market was not ready for a new emission standard and sales plunged. Fleet owners rushed to revalidate their COEs when the premium hit $1 for six consecutive tenders in early 2007. Last year's record was partly fuelled, ironically, by high COE prices. Mr Ron Lim, general manager of Nissan agent Tan Chong Motor, said: "Car owners were expecting COE prices to come down, and they were buying time. 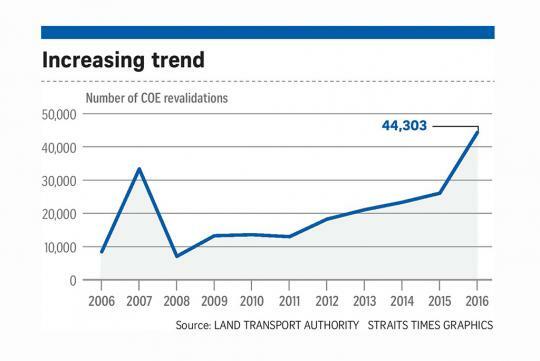 Indeed, the LTA figures showed that more than three-quarters of car COE revalidations were for five-year periods. COE revalidations can be done for either five or 10 years. For cars, five-year revalidations cannot be further extended, but those for 10 years can. Mr Lim noted: "Most of the revalidations happened in the first half, before the car loan restrictions were relaxed." The Monetary Authority of Singapore eased car loan curbs in May. Last year's record figure - representing nearly one-third of vehicles which had turned 10 years old in 2016 - dovetails with an ageing vehicle population. Motorists are keeping their cars a lot longer than before. Today, 44 percent of cars are between seven and 10 years old, versus merely 2 percent a decade ago. Observers see the trend continuing. Car dealers pointed to models which qualified for the Green Vehicle Rebate and the Carbon Emissions-based Vehicle Scheme as prime candidates for revalidation. These cars will have low or negligible scrap rebate. "The opportunity cost for owners who are considering revalidation will be low," noted Mr Lim. Mr Norman Lee, honorary general secretary of the Singapore Motorcycle Trade Association, said the recently announced tiered taxation for big motorbikes will also fuel revalidation. Motorcycles are not entitled to a scrap rebate, so Mr Lee said owners of big motorbikes will definitely be more inclined to renew COEs to keep their far costlier rides for a longer period. Motorists are more open to keeping their cars beyond the 10th year today than before. Pilot Alex Puah, 39, said he is considering revalidating the COE for his Toyota Sienta when it expires next year. "It is a lower cost than buying a new car," he said. "If the COE drops to $40,000 or less, I will renew." Mr Puah said the cost of revalidation has to be reasonably low, so as to offset the higher cost of keeping a car beyond 10 years. "Maintenance, road tax and even insurance will be higher," he reasoned. Business owner Andy Goh, 48, who runs an electrical consultancy, is, on the other hand, hoping commercial vehicle COE premiums will plunge this year. "If they do, I will scrap my high-COE van and get a new one," he said. The COEs of more than 13,000 commercial vehicles will be expiring by next month. Mr Lim of Tan Chong said: "Even if one-third are scrapped, it will result in 4,000 fresh COEs coming back into the system. That is four times the current supply. It will be interesting to see what happens." On one hand there's stricter emission standards to come in place (in the clever guise of collecting more revenue via taxes). On the other end, there's significantly more older pollutive vehicles on the road when COE of 10 year old cars are renewed.